Recently I have become involved in an exciting new local project, which is the brain-child of Louise Spong who lives not far from me here in West Sussex. 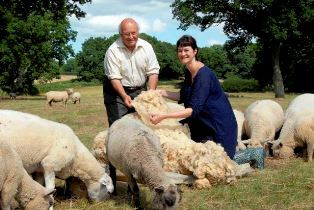 Louise has set up South Downs Yarn, a business selling 100% pure wool yarn from the fleeces of local Sussex Southdown sheep, spun to her specifications in a mill in England. 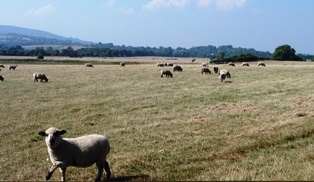 Southdown sheep have grazed on the South Downs in Sussex for centuries and are an important part of the local landscape. 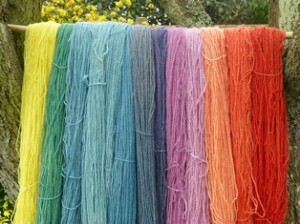 They are small and docile animals with appealing woolly faces and have relatively short fine, dense wool. 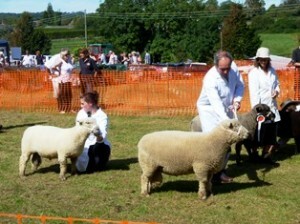 Most Southdown fleeces are white but occasionally a lamb will be born with a black fleece and these black fleeces are of special interest because of their rarity. The first batch of yarn to be available on Louise’s website is from David Burden’s flock of pedigree Southdown sheep near Petworth in West Sussex. At present only natural creamy-white yarn is available but Louise intends to offer limited-edition naturally-dyed yarns in the future and this is where I am involved on a consultancy basis. A few weeks ago Louise spent a weekend with me and we experimented with several dye baths, including madder, indigo, weld, chestnut and walnut. The Southdown wool makes a lovely bouncy, springy yarn, which dyes beautifully into full, rich colours, and I am looking forward to working with Louise on more dyeing projects in the future.